this day in crime history: november 26, 1933 | Nobody Move! 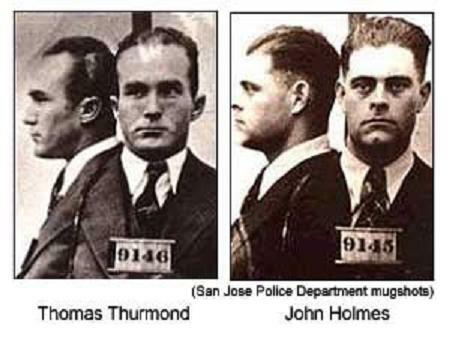 On this date in 1933, the people of San Jose, CA decided to take the law into their own hands. Thomas Thurmond and John Holmes were being held in connection with the kidnapping and murder of 22 year old department store heir Brooke Hart. The townsfolk, already enraged by the nature of the crime, whipped themselves into a frenzy when rumor spread that the two men were going to try an insanity defense. On the night of November 26th, they stormed the jail, broke down the door, and took the two men. The crowd brought them to a nearby park, where they hung each man from a tree. No one was ever prosecuted for the lynching. In fact, California Governor James Rolph, who had refused the Sheriff’s request for National Guard troops to hold off the mob, praised the action and promised to pardon anyone charged with the lynching. Wasn’t California a MUCH nice place before the 1970s?